Tell Us What You Think #PeaceMakerGame and More! If you found us and are playing PeaceMaker we want to hear from you and want your help to spread the word about the game. Here are a few ways that we would love for you to tell us what you think. We have also recently had some requests from people wanting to write about us that would love to speak to some of you. If you are willing to share your story please use the contact option to let us know and we will pass along your information. Due to the nature of the content and our sensitivity to the experience we didn’t include the pop-up that asks you to rate the game while you are playing it. This definitely doesn’t mean we don’t want you to do so. If you have played the game and have an opinion good or bad don’t hesitate to do so in the different app stores. We would love to hear your thoughts and experiences #peacemakergame and hope we can get it trending enough to give people a sense of the experience people are having with the game. Tweet us directly at @impactgamespgh. We were a little late to jumping on twitter handles related to our company and game so it seems a bit obscure but that is us and we will respond as best we can. We have a couple of different presences on Facebook. You can check out our ImpactGames page our PeaceMaker page or join our I Wanna Be A PeaceMaker group! Using our contact form is a sure fire way to get us. Need to send us more information than makes sense in any of those channels we are always reachable through this blog or our contact form and happy to do so. 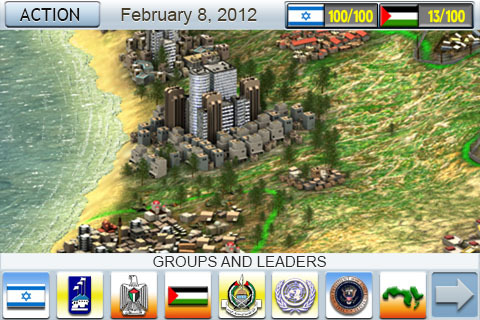 I am excited to say we have released the mobile version of PeaceMaker. We hope this will help broaden the availability and exposure of the game to new and exciting areas and audiences. I want to thank our dedicated team for their great work on this project. A big thank you to all of our Beta testers. I also want to thank the people who have continued to support us and use/play our game over all of these years. Your vocal disappointment when our old version stopped working kept the pressure on for us to get this development completed. We are also excited to offer the game through the desktop AppStore for MacOS and soon through other avenues to insure access for PC users. While the new design was primarily with mobile devices in mind we think it translates well to desktop (and makes the game available to those without mobile access). We do plan to further optimize the desktop build as we move forward. Please continue to let us know about issues you may find and ideas for improving the game. We hope this is going to open up new avenues for us to continue to develop the platform, new titles, and new languages. PS. If you do not see the game in the app stores one reason may be that we were forced to give it a 17+ rating. I will write more about that later but we hope this does not limit your access. We are very close to submitting for release. Different platforms may come online at different points depending on review and approval process. Currently we are making a push on the mobile version for Android and iOS with a desktop version to follow. We are looking for people willing to beta test different platforms so please contact us through the contact form if you are interested. We are especially interested in fluent Hebrew and Arabic testers to validate our new menus and that the localized files transferred correctly into the new builds. Look for more news in the upcoming week(s). I want to put a date to it but as with any release every time we think we nailed it a tester points out a usability issue or finds a bug. Our open issues currently number in the handful so the optimist in me is counting down the days to release. Once we launch we will be discontinuing the old version of the game. For now if you are desperate to play and are willing to work with the technical problems associated with our old build it can still be downloaded from the About page as the classic version of Peacemaker. Asi Burak’s recent interviews have renewed interest in PeaceMaker and prompted a bunch of inquiries into whether the game is being updated or if there is a mobile version currently available or in the works. The simple answer is yes. Broadening our impact through wider distribution as well as updating the engine to be more stable on new computer environments is something we have always viewed as important and we have been working on a port for some time now. Through the new engine we will be better able to update the content of the game itself. We are not sure at this time if version 1.0 will be updated with new content or just be a port of the current version of the game to mobile, but it will make it a lot easier to do so in the near future. The new engine is also the first step towards our other goal of creating a more strategy game publishing platform or “PeaceMaker Platform” (name TBD) that will allow others to build their own versions of PeaceMaker on whatever scenarios are important to them. At this time we have not set an actual launch date for the mobile version but we are in a very early beta and things are moving along fairly smoothly so please check back for more details or keep an eye out in the app stores. Asi Burak was asked to write an article for Kotaku reflecting on his role in designing Peacemaker given current events. I will just link over to it for you so you can read directly his words. I also thought I would link to a post by Tim Sweeney a long time ago regarding our design assumptions related to the game as it seems relevant to the article. Thank you all for your support over the years. We are pleased to announce that we are finally making PeaceMaker free to the public. Our newest build doesn’t require any serial number activation and can be freely downloaded from the site. We hope this will allow the game to find an even larger audience in schools, community centers, and the general public. Having Technical Issues? Read this first! Enjoy and check back for news on future projects related to PeaceMaker. We currently have a mobile version of the game under development which will also address technical issues related to this version. This new development is also getting us moving down a path that will make a PeaceMaker toolkit available that will allow anyone to try their hand at making a version of PeaceMaker for other conflicts and social issues. The live site is no longer being hosted by Rand McNally so I thought I would post a slideshare showcasing the project since we are very proud of our efforts and the outcome. First let me thank the fine folks over at Rand McNally for giving us this amazing opportunity. It had been since our partnership with the University of Missouri Journalism School that we had the opportunity to have an active community and it is always exciting to see people engaging with our platform. We still strongly believe in the platform and hope that there are more great partnerships and life left in Play the News and its future iterations. Watch out for new things to come.